As Valentines Day approaches, it's not a bad idea to have a few appropriate treat recipes in store. Of course, these cookies are great anytime! 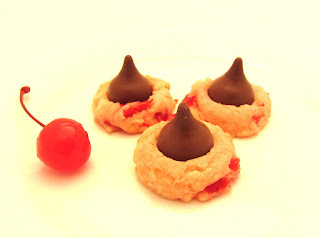 I made my cookies with Hershey Cherry Cordial Kisses, which in my area, are only available around Christmas and Valentines Day. If you can't find cherry candies, regular Kisses work very well, too. This recipe is just slightly adapted from one, credited to Better Homes & Gardens The Ultimate Cookie Book, on The Curvy Carrot. These cookies are very easy to make, quite pretty, and certainly tasty! *The cookies in the photo were made from tablespoon-sized balls of dough. This resulted in 64 cookies. There were only 51 candies in an 11 oz bag. You could make the cookies from tablespoon and a half sized balls of dough to make fewer cookies, you could buy two bags of candy, or you can have some cookies without candies (they're still delicious). 2. Beat the butter in the bowl of a stand mixer until creamy. Add the powdered sugar and beat until creamy again. Add the cherry liquid, vanilla, and salt. Beat until thoroughly blended. 3. Add the flour and beat on low speed until the dry ingredients are just incorporated. Add the chopped cherries and continue beating on low until just blended. 4. Scoop tablespoonfuls of dough (see note above) onto the prepared baking sheets, leaving about 1 1/2" inches between each. 5. Gently press the center of each dough-ball with your finger, making an indention. 6. Bake the cookies for 12-13 minutes or until the bottoms are light golden brown. 7. Press a Hershey Kiss into the center of each cookie. Transfer the cookies to racks to cool completely. Do not disturb the cookies as they cool or the melting chocolate candies can become misshapen.